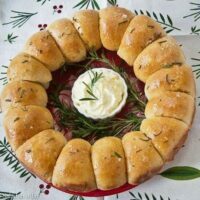 Browned Butter and Rosemary Yeast Rolls are savory dinner rolls flavored with brown butter, rosemary, and black pepper. Hand-shaped rolls are then configured to make a festive wreath perfect for your holiday table. Although this recipe comes with bread machine instructions, you can make them by hand or with a stand mixer. See the notes on the recipe. Are you looking for something easy but festive for a holiday gathering? 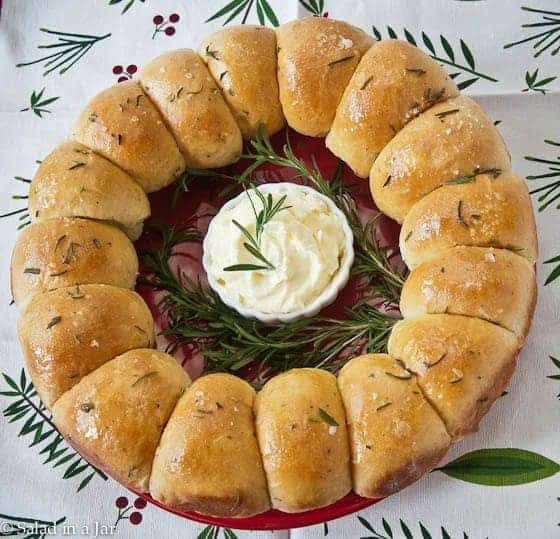 Although homemade yeast rolls issue an aromatic, come-hither statement on their own, this simple wreath configuration is guaranteed to make them memorable. Don’t fret if you aren’t Mr. or Ms. Bread-Baker-of-the-Year. 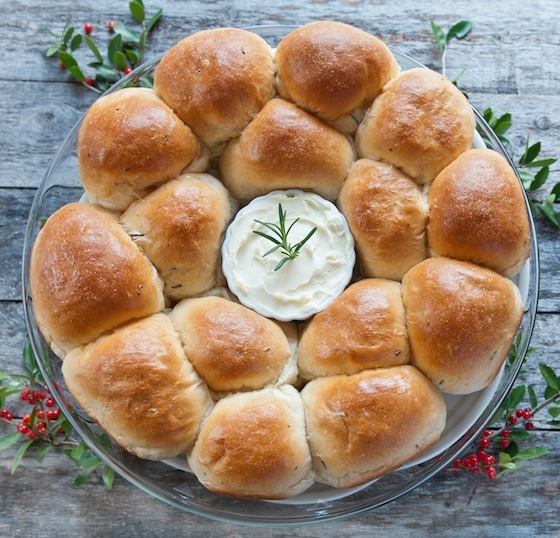 Below is a list of various ways you can create these Browned Butter and Rosemary Dinner Rolls for your holiday table. No time or too many bread-baking insecurities? Use store-bought frozen bread dough. 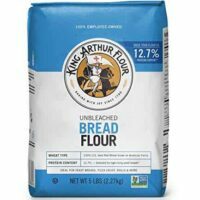 No desire and/or time to mix and knead bread dough by hand? Use a bread machine or a heavy-duty stand mixer to do the job. You could even use a bread machine mix from the grocery store. Already have a favorite roll recipe but want to dress it up? After letting your dough rise, start with the instructions for shaping the rolls in step 5 and proceed as directed. Not sure about the wreath but want to try the rolls? (They make great slider buns.) 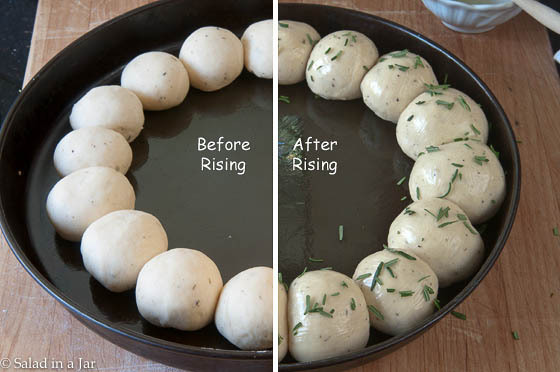 Skip the whole wreath idea and put dough balls into two 8 or 9-inch pans as seen here and start from step 5 in the recipe. If you haven’t already, be sure to check out this video for instructions on how to make perfect little balls with yeast dough. No fancy twisting, knotting, or similar frustration required. I used a 13-inch pizza pan. Brush rolls with butter and sprinkle with herbs and salt just before placing them in the oven–if you like. Here’s another option, just because I’m having fun with this recipe. As you can see in the picture below, I put an oven-safe measuring cup in the middle to maintain the wreath shape. If you would rather hang a bread wreath on your door instead of eating it, you must check out this post by my friend, Paula, of Vanilla Bean Baker. The idea of the wreath comes from Martha Stewart Living. Recipe adapted from my very favorite bread cookbook, One hundred years of bread: Classic breads from your bread machine by Sidney Brockman Carlisle. Melt butter on stove and turn to lowest temperature and allow to turn brown. (Careful not to go too far and let it burn.) Or, see my directions for doing it in the microwave in link above. 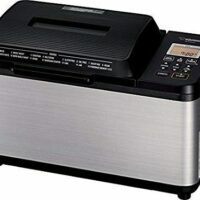 Add to bread machine bowl. Heat milk in microwave for 1 minute on HIGH. Add to bread machine bowl along with remaining ingredients in order given. Select dough cycle and start. When dough cycle completes, dough should be risen to double. If not, allow to sit in machine until it is. Remove dough to a floured surface. Divide dough into 15 equal pieces and make into smooth balls. 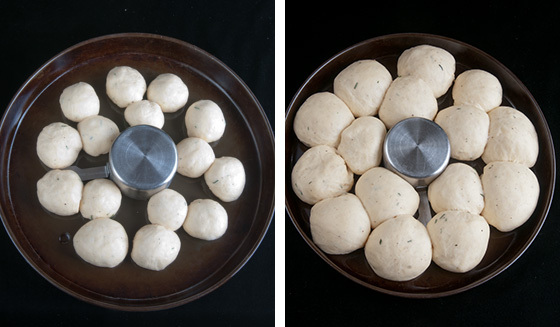 Arrange on a round pizza pan 13-inches or larger, in a single or double circle as illustrated in the pictures above. Cover and allow to rise until almost double. If desired, brush with melted butter and chopped rosemary. Sprinkle lightly with sea salt. Bake in preheated 375 degree oven for 12 to 15 minutes until golden brown. To make this in a heavy-duty mixer, add ingredients to the bowl in the same order. Turn on low to mix until all ingredients are moistened. Using dough hook, turn speed to 2 or 3 and continue beating/kneading until dough becomes smooth and elastic, about 5-10 minutes. Cover and allow to rise in a warm place. Deflate dough gently and start with step 5. If making by hand, combine all ingredients in a large bowl. Turn dough out on a floured surface and knead until dough becomes smooth and elastic, probably 10-15 minutes depending on your experience. Place dough into a greased bowl. Cover and allow to rise until double. Deflate dough gently and start with step 5. If using frozen bread dough, let rolls come to room temperature and start with step 5. That wreath is so pretty! And since you can use store-bought dough, I’m in! My whole family enjoyed these. I substituted one cup of flour with whole wheat just to make them a little more healthful, and they were delicious. Thanks for the recipe. Really good as sandwiches with baked ham. Glad to hear you like them Pam. I can imagine they were fabulous with the whole wheat flour. Thanks for reporting back. Absolutely wonderful. I can smell Christmas already. Delicious. Thanx Paula. Absolutely gorgeous, Paula! I can imagine the smell of these beauties while baking! And your Christmas themed presentation is gorgeous! BTW, I love your videos! Very useful, and very well done! I love the wreath- so pretty for a party! Beautiful and delicious I’m sure! Love this! Great post, Paula, and I love the tip about the measuring cup. Beautiful photo. They look absloutleysuper beautiful and double delicious, love the flavours in those rolls. I made these last night for dinner. Oh, my! Wonderful, flavorful, pretty, easy and, best of all, delicious! Thank you for the inspiration to get back into bread-making. Thanks so much for the mention and the link-back to my site. So nice of you and I appreciate it. PS Very good tutorial on how to make yours. Oh my Paula, I have just gained 5 pounds by looking at your pictures! I’m so glad to have you as my scapegoat! 🙂 These look incredibly delicious! I just have a question: could I use instant yeast instead? I don’t live in America and I’m afraid I won’t be able to find the type of yeast you mention to use to make this bread. It looks yummy, beautiful, and even easy to make. Yes! 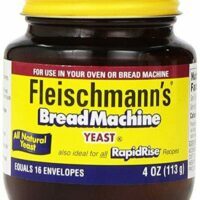 Instant yeast will work beautifully.